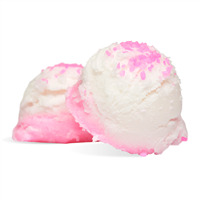 This deliciously scented cherry vanilla bath truffle will fizz and bubble in your tub. The combination of cocoa and shea butters will leave your skin soft and moisturized. 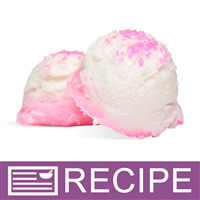 • (1) Ice Cream Scoop - Squeeze Handle-1.5"
NOTE: If you are making these product for sale, good manufacturing practices recommend you wear a hairnet, gloves and a mask. We also recommend a clean apron and workspace. In two mixing bowls, measure out 1 cup baking soda and 1/2 cup citric acid to each bowl. Blend mixture. Use a sifter to remove any clumps that appear. To one bowl add 1/8 tsp. of color and blend well with a wire whisk. Add 5 ml of Cherry Vanilla Fragrance Oil to each bowl and mix well with whisk. Set aside. Place 4 oz. cocoa butter and 2 oz. shea butter into a double boiler and heat until butters have completely melted. Stir melted butters and pour 3 oz. into each bowl of dry ingredients. Mix with a spatula to incorporate the ingredients. Using the scoop, fill half with white mixture and the other half with pink mixture. Place scoop onto a cookie sheet. Continue in this manner until all product is used. Mixture will yield approximately 24 scoops. Place the 2 oz. of Epsom Salts in a bowl. Add 1/8 teaspoon of Neon Pink Pleasures Powder color and mix well into the salts. Sprinkle the pink salts on top of the truffles. Let set out to dry overnight. Place 4 bath truffles into a cello bag and tie with curling ribbons. To Use: Add 1-2 bath scoops to running water. Let melt and soak in tub. WARNING: Product will make tub slippery. Be careful when entering and exiting bath. Ingredient Label: Baking Soda, Citric Acid, Sodium Lauryl Sulfoacetate, Cocoa Butter, Shea Butter, Magnesium Sulfate, Fragrance, Red 28, Red 22. "Good day! Tell me how many ounces or grams of soda in 2 cups (prescription), 1 Cup of citric acid and 1 Cup SLSa. Yours, Elena." Staff Answer Two cups of baking soda is equal to 19 oz. One cup of citric acid is equal to 8 oz. and one cup of Lathanol Powder is 5.80 oz. "Can i add poly 80?" Staff Answer Yes, poly 80 can be added to this recipe. Recommended use levels are 1-20%. "How many cups are in 1 pound of SLSa?" Staff Answer There are approximately 3 cups in 1 lb. of Lathanol Powder. "Do these truffles fizz, bubble, or both? Usually products with SLS or SLSa that bubble need to go into the tub while the water is still running, but fizzy products are usually put into still water. I'm not sure what to do with these... Thanks!" Staff Answer These truffles will both fizz and bubble. Once added to the warm water, they will fizz, bubble and melt into the water. They can also be placed under running water to make them melt more quickly. "I used weights instead of dry measurements for the baking soda, citric acid, and SLSa: so, 8 oz instead of 1 cup, etc. Will this affect my final product? It seemed like I used more than 1 cup measuring cup of the baking soda to weigh out the 8 oz. Thanks." Staff Answer One cup of baking soda is slightly lighter than 8 ounces and one cup of citric acid is slightly heavier. Although it shouldn't affect your final product too much we do recommend following the recipe as written to ensure a successful batch. "Can the quantities of the two butters be swapped? I don't have enough Cocoa Butter, but have enough Shea Butter for the amounts listed. Alternatively, can the cocoa butter be removed from the recipe and replace that amount with Shea Butter?" Staff Answer Coco butter was used because it is a harder butter, Shea butter is a softer butter. The truffles may not harden if you swap out coco butter. "I was wondering are these cute little truffles supposed to be hard like bath bombs when they are finished? Or are they supposed to be a little soft still. I have had my batch drying for about 5 days and they are slightly soft to the touch. Please help. 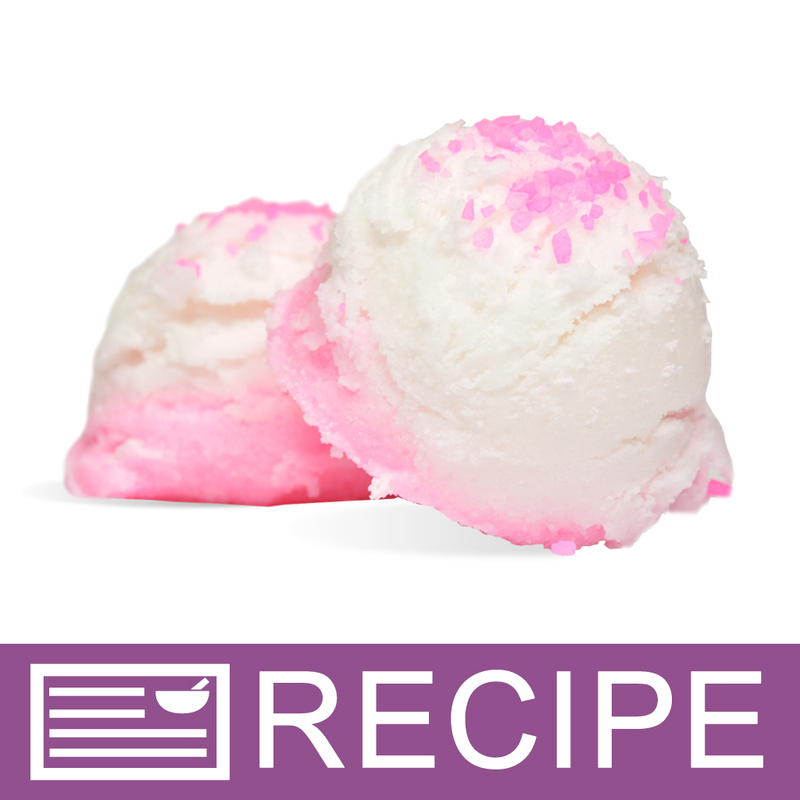 :-)"
Staff Answer Hi Charna - Ours turned out hard, but were a bit more crumbly than a bath bomb. We had them sit overnight, and the next day they were hard. Perhaps the measurements were a bit off? Maybe check to make sure your scale is working properly. It could also be the climate you live in. Do you live somewhere that is hot and humid? This could prevent them from hardening. Adding white kaolin clay can help with making them harder. "Just wanted to let ya'll know that the INCI is wrong. You have baking soda listed twice. Its suppose to be citric acid." Staff Answer Thank you! We've fixed the INCI listing. It may take 30 minutes for the changes to appear on the website. "Can you substitute the fragrance for another one?" Staff Answer Yes, you can substitute any fragrance you like. Just be sure to follow the IFRA guidelines for the new fragrance. "What would you charge customers for these?....How much would be for 1 & how much for a 3 pack of these darling truffles? =) Thanks! <3 "
Staff Answer Retail pricing will vary from one location to the next. We recommend that you set your own pricing based on the retail pricing of similar product for your area. A commonly used pricing formula is Supply cost x 4 = Retail. "Will the vanilla in the fragrance oil cause the truffles to turn brown?" Staff Answer Without a stabilizer this product stays true to color for few months. You could always add a stabilizer if you would like. I suggest using the stabilizer for CP. "I see "Bis(Glycidoxyphenyl)propane/Bisaminomethylnorbornane copolymer" listed in the INCI ingredients. What is the ingredient that contains that and can it be avoided? Is there a substitute for the SLSa too?" Staff Answer The Neon Pink Pleasures Powder Colorant contains the Bis(Glycidoxyphenyl)propane/Bisaminomethylnorbornane copolymer. You can substitute another colorant if you do not wish to use this one. The SLSa is used as a powdered bubbleing agent in this recipe. We do not carry any substitutions for this ingredient.